Elizabeth Taylor - Michael Jackson The God Of Music ! Elizabeth Rosemond Taylor was born to an American art dealer and his wife in London, England, on February 27, 1932. With the threat of World War II looming, the family returned to America when Elizabeth was seven, relocating to Los Angeles instead of their original home in St. Louis, Missouri. A family friend with connections at Universal Studios suggested a screen test for the little beauty. Universal signed her to a contract, but dropped her after one film. At age ten, she signed with MGM. Her first film there was Lassie, Come Home(1943). 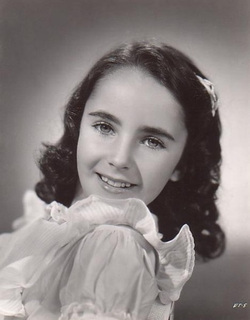 The hit film National Velvet (1944) brought Taylor stardom, and she became a major child star at MGM. Other early films included: The Courage of Lassie, Life with Father, A Date with Judy, Julia Misbehaves, and a part in 1949's Conspirator that pushed her into adult roles at the tender age of 16. Taylor's stardom peaked in the early '50s with some major roles, many of which were showcases for her startling beauty: Father of the Bride (1950), A Place in the Sun (1951), Father's Little Dividend (1951), Rhapsody (1954), and Beau Brummell (1954). In 1954, she replaced Vivien Leigh in Elephant Walk. The original script concerned an older woman and a younger man. When Leigh could not continue, Taylor was suggested because they could use Leigh's footage in the long shots. One producer looked at Taylor's photo and commented, "If this woman comes down the stairs and says to Peter Finch, 'come to bed,' and he stays with the boys and plays cards, people are going to think he's going to bed with Dana Andrews." It was said that when Taylor walked into the MGM Commissary, a hush would fall over the room, she was so beautiful. Once, she entered with her mother, and there was the usual hush. After the Taylors were seated, someone joked aloud in the silence, "How did SHE ever get into movies!" After 1956's Giant, with Rock Hudson and James Dean, Taylor made Raintree County, for which she received her first Academy Award nomination and was reunited with her friend from the smashing A Place in the Sun, Montgomery Clift. Other important films from the mid-to-late '50s were Cat on a Hot Tin Roof (1958) (a second Oscar nomination), and Suddenly, Last Summer (1959) (a third Oscar nomination). Cat on a Hot Tin Roof was being filmed when her husband, Mike Todd, was killed in a plane crash. Director Richard Brooks ordered repeated takes of the picnic scene so that Taylor would eat. Taylor finally won the Oscar for her role as a call girl in Butterfield 8 (1960), but even to her, it seemed like a consolation prize. Shortly before the award presentations, Taylor became deathly ill with pneumonia. To Shirley MacLaine, nominated that year for The Apartment, Taylor's illness sealed the Oscar. MacLaine said, "The minute Elizabeth became ill, I canceled my trip to Los Angeles." After her contract with MGM ended, Taylor signed with Twentieth Century Fox in 1960 for Cleopatra at the then-unheard of salary of $1 million. The film took three years to make, during which Taylor fought life-threatening illness, weight loss, weight gain, and marriage woes as her then-scandalous affair with costar Richard Burton grabbed headlines. The over-budget, $44 million film was a disaster for the floundering Twentieth Century Fox. The death of her friend Rock Hudson in 1985 led her to create the Elizabeth Taylor AIDS Foundation to raise money to fight the disease. She also became a businesswoman, starting the Passion, White Diamonds, and Black Pearls fragrance lines, and, more recently, a line of jewelry, The Elizabeth Taylor Collection. Taylor's "private" life has been media fodder since the late '50s. An often-asked trivia question is the names of her husbands in order. They are: Conrad "Nicky" Hilton Jr. (1950-1951), Michael Wilding (1952-1957, two sons), Mike Todd (1957-1958, when he died, one daughter), Eddie Fisher (1959-1964), Richard Burton (1964-1974, adopted daughter Maria; remarried 1975-1976), John Warner (1976-1982), and Larry Fortensky (1991-1996). The scandal sheets had a field day with Taylor. She was accused of breaking up the Debbie Reynolds-Eddie Fisher marriage; she entered into an adulterous affair with Burton during Cleopatra; her two bouts with pneumonia were front-page news; and her jewels are world famous, the most prominent being the 33.19 Krupp diamond, a 69.42-carat diamond, and the 50-carat La Peregina pearl, all gifts from Burton. In 1997, Taylor endured a successful operation for a brain tumor, though she later suffered from scoliosis, osteoporosis, and heart problems. Usually confined to a wheelchair, she made occasional charity and business appearances in later years. 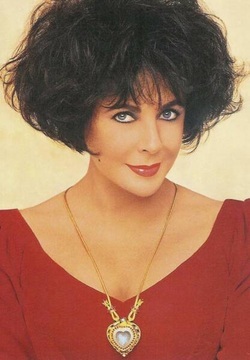 On March 23, 2011 Elizabeth Taylor left us. legendary film star, Elizabeth Taylor was perhaps the last real star to emerge from Hollywood's classic era. She proved that she was more than a beautiful face, though she will always be remembered for her stunning looks and her vibrant screen presence from her childhood films to her soap opera roles. For Us Elizabeth Taylor will always be remembered us The Queen Of Love.